‘70s cars were big ol’ boats. ‘80s cars were boxy. ‘90s cars had some funky curves (looking at you, Taurus). Today’s cars are universally sleek and have… strong roofs? That’s right. You probably haven’t noticed that in recent years, cars, SUVs and trucks have bulked up their roofs and the pillars that support them. This is great for safety, but not so great for visibility (we’ll get to that in a moment). The bulked-up roofs can be cited back to one culprit: the increase of cars that experience a rollover accident. Think way back to 2001: Do you remember the Ford Explorer rollover scandal? In thousands of instances, the tread separated from the Explorer’s defective Firestone tires, causing the SUV to roll over and crash. An estimated 174 people were killed in rollover accidents, and thousands injured. But this tragedy had long-lasting positive effects: It brought attention to the problem of rollover crashes associated with SUVs. “Rollovers account for only 3% of crashes but more than a third of occupant deaths,” the Wall Street Journal reported in 2005. Why? Just picture it: In an SUV or car rollover, the roof may press against occupants’ heads, causing severe or fatal injuries. The National Highway Traffic Safety Administration (NHTSA) stepped in, writing new rules that said car roofs had to withstand a force of 3 times the vehicle’s unloaded weight. For heavier SUVs and trucks, 1.5 times the vehicle weight. We all know the government moves slowly, and this rule was no exception. It was written in 2009, but the final deadline for complying was 2017. Which Cars are Best for Rollover Safety? In 2009, the Insurance Institute for Highway Safety also launched a roof strength rating system. The system worked to identify vehicles that help to protect passengers in a rollover accident. In its tests, the IIHS pushes a metal plate against cars’ and SUVs’ roofs. Some crumble; some barely flex. Watch the awesome crushing action here. Of the 12 small SUVs they tested in 2009, only four earned the top rating of good. Thankfully, that has changed. Of the 2017 models, almost every SUV, car and pickup truck tested earned a good rating for roof strength. The worst rollover SUV’s and vehicles of 2017 were the Toyota Tundra (acceptable), the Ram 1500 (marginal), the Dodge Challenger (acceptable) and the Chevrolet Camaro (acceptable). If you are in the market for an older used car, it’s important to review the rollover accident statistics before purchasing. Convertibles are exempt from the roof-strength requirements because few of these cars roll over in accidents. They’re still not as safe as cars with roofs, however. Sunroof cars have roofs as strong as those without sunroofs, although they may not be as safe in rollovers if the glass breaks, an IIHS spokesman says. So now, new cars can boast vastly improved rollover safety — but to do that, automakers had to beef up the support pillars that hold up the roof. These are called the A-, B- and C- pillars: the A-pillars frame the windshield, the B-pillars are between the front and rear windows, and the C-pillars support the rear windows. (Wagons may also have D-pillars). The problem is that the new, chunkier A-pillars make it harder for left-turning drivers to see pedestrians and cyclists. And bigger C-pillars obscure rear visibility. So if you’ve driven a new car recently and thought, “I just can’t see,” you’re not alone. Now, the good news: car makers know this is a problem, and they’re working on it. Thinner (but still strong) pillars, improved mirrors, blind-spot monitors and rear-view cameras all can help. The all-new 2018 Toyota Camry (which looks pretty amazing) has “some of the thinnest A-pillars Toyota has been able to produce,” Automobile magazine noticed. 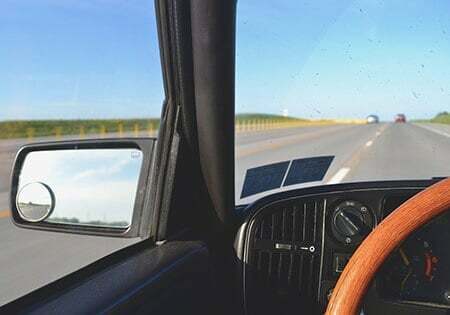 Consumer Reports has compiled a list of the best and worst cars for outward visibility, if you’re shopping for a new car. Three Subarus win top honors, along with the Land Rover Range Rover Sport, the Honda Fit, the Nissan Altima and others. 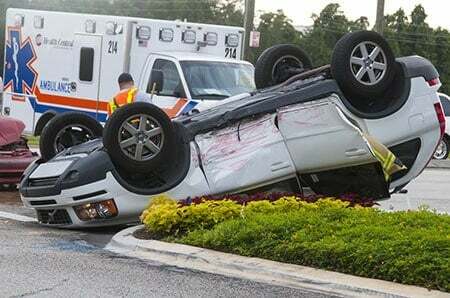 Even as cars become safer, a rollover accident is always a possibility. Reduce your risk of injury by researching the vehicles most likely to roll over and avoid them as much as possible. Then, protect yourself, your car and your passengers with the best car insurance you can afford. You can find the right plan for you in minutes on Compare.com.